In honor of Earth Day, we’re hosting an extra-special Earth Day Pint Day. You read that right: our usual Charity Pint Night becomes an all-day event on Monday, April 22nd, tripling its impact! Yes, it’s a Monday, but we’ve got wi-fi and better-than-coffee brain fuel; tell your boss you’re working remotely, or just play hooky(! ), anytime from 10:00am to close at the Vault. One dollar of every pint sold will benefit some very special local gardeners: the kids of Granite County! Sip our seasonal craft beers to support continuation of the garden programs at Philipsburg and Drummond public schools. These programs teach students what a garden requires to produce food and allow for sampling of tomatoes, broccoli, peas, lettuce, spinach, kale, and other vegetables picked only moments before, a new experience for some students. They additionally support the work of Montana Harvest of the Month cafeterias, which highlight Montana-grown foods every month of the school year. 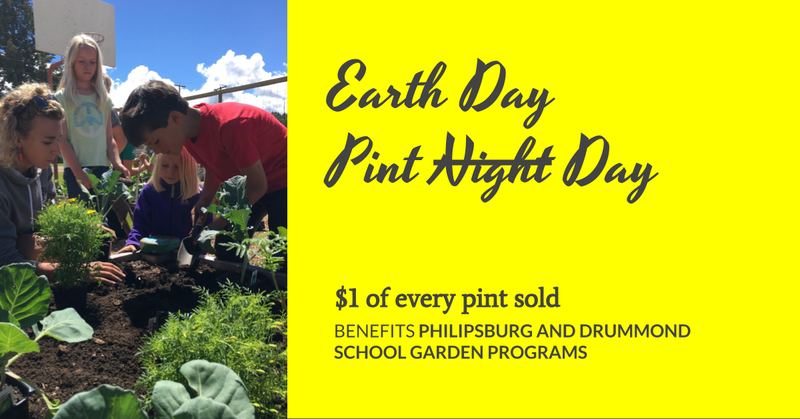 All funds raised from Earth Day Pint Day will specifically go toward garden supplies and maintenance at the Philipsburg garden, and supplies and plant starters/seeds for the Drummond school greenhouse. We're into giving back. Subscribe below to learn what's up next.